The Huguenot Mill in Greenville was built on the banks of the Reedy River in 1882. Founder Charles Lanneau opted to use coal power rather than hydroelectric power, despite the mill’s construction along the river. The Huguenot Textile Mill – also known as the Huguenot Plaid Mill – became one of the Piedmont’s first coal-powered mills as a result. It was also the first textile mill in the state to weave together plaid and gingham materials along with cotton. The mill was fireproof, a common construction feature of New England mills. It later served as the Nuckasee Manufacturing Company and has undergone several modifications over the years to accommodate the building’s varying roles. The mill served as a garment factory and an outlet store in the 1970s before it was purchased – along with three adjacent nineteenth-century industrial buildings – in the 1980s as part of the Peace Center. This public-private venture restored the textile mill as well as the other buildings – a mayonnaise factory, a store, and a coach factory – and integrated them into the performing arts center while also building the Peace Concert Hall and Gunter Theatre. Today the Huguenot Mill is utilized as offices and event space. 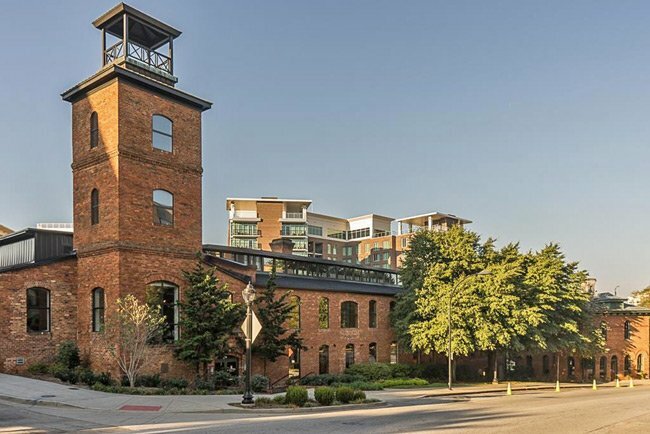 The Reedy River Industrial Complex is the only area in downtown Greenville which has maintained its historic and architectural character as a nineteenth and early twentieth century industrial and commercial district. Featuring six industrial or commercial structures constructed between 1850 and 1914, the Reedy River Industrial Complex represents Greenville’s transition from a nineteenth century summer resort and agricultural village into a leading international textile center. Visually connected by the Reedy River, these structures were historically developed as portions of a related industrial complex which served the Greenville Coach – Markley Carriage Factory and the Huguenot Mill. The contributing resources include: the Greenville Coach Factory Blacksmith Shop (ca. 1850); the Markley Carriage Factory Paint Shop (prior to 1915); the Markley Hardware Store (between 1905 and 1914); the Huguenot Mill (1882); the Huguenot Mill Office (ca. 1890-1900); and the Cotton Warehouse (between 1908-1913).